SIOUX CENTER – Kristen Schuler discovered that the role of a nurse is more than needle sticks and medication passes while being hospitalized for a couple of weeks during her eighth-grade year. She was positively impacted by her nurses during that time in a way that she never knew was possible. Health Center in Sioux Center. And she knew she wanted to become a nurse someday. Schuler now is embarking on her career journey as a new registered nurse at Promise Community Health Center in Sioux Center. She is looking forward to gaining independence as a nurse, building her skills and being part of a team that works and functions well together. But, most importantly, she hopes she can impact the people who she serves for the better. 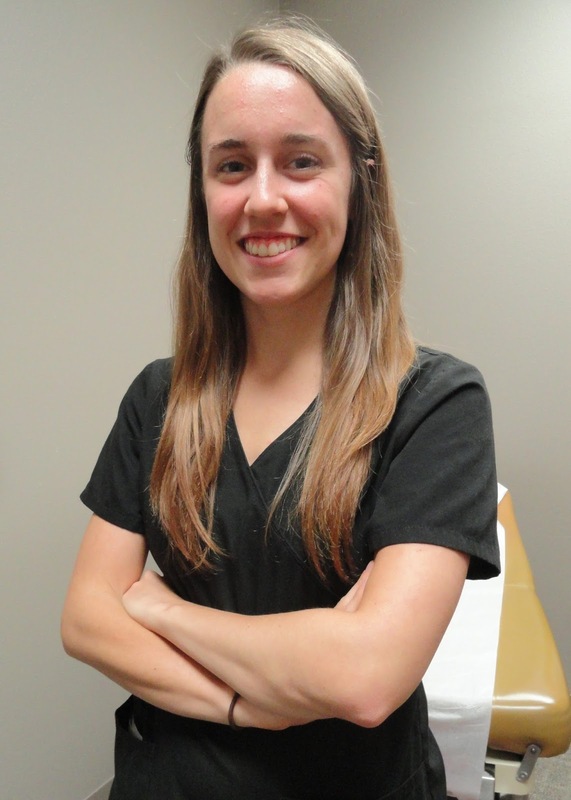 Schuler graduated from Atlantic High School in 2011 and earned her bachelor of science degree in nursing from Northwestern College in Orange City in May. She also worked 2012-14 as a certified nursing assistant at Heritage House Nursing Home in Atlantic. She first heard about Promise through Northwestern’s nursing department and learned more about the health center and its mission as she continued through college. She now is excited to join Promise’s team. In her free time, Kristen Schuler enjoys spending time with family and friends; traveling and being outside; playing the piano; being too competitive with board games; and learning new concepts, skills and perspectives. She enjoys drinking coffee and eating banana bread. 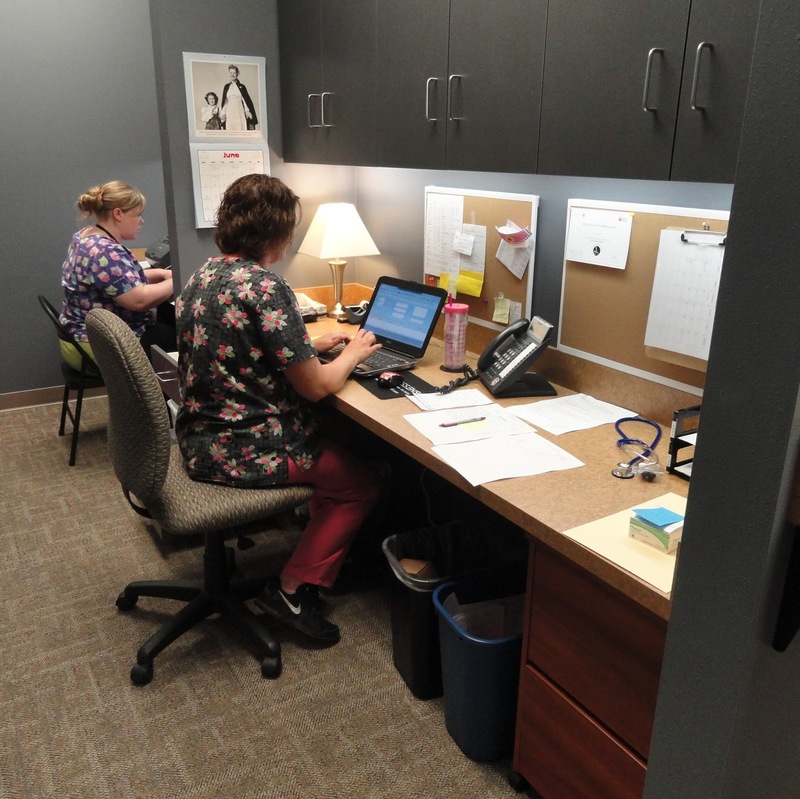 SIOUX CENTER – Promise Community Health Center employees aren't feel as cramped anymore. They have been settling into about 3,000 square feet of expanded space in the east side of its downtown Sioux Center building during the past couple of weeks. The project, which was made possible through a $250,000 federal capital improvement grant awarded in August 2014, has increased the health center’s space by about 60 percent. Various staff members moved into their new offices two weeks ago. The prenatal team completed their move to their new wing this week and began serving expecting mothers and babies in two new exam rooms. The expansion also freed up space in the health center's original area for staff members to move into for less cramped quarters. The project now moves into the renovation phase. The front lobby and reception areas, along with other existing spaces in the medical area, will be remodeled. One of the most exciting components of the building project is the new community education and conference room. The room will be used for board meetings, staff meetings and training sessions, and community health education classes. 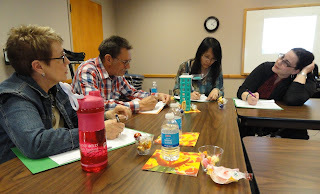 In the past, Promise had to arrange for such meetings at Sioux Center Public Library, churches or other places in the community. Promise now will be able to offer classes and meetings on site, allowing it to greatly increase community education outreach in the future. first events in the new community education room. group meeting in the conference room. 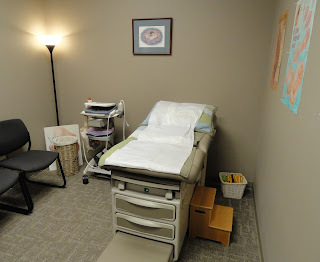 The new prenatal area includes two back-to-back work pods and two exam rooms. Previously, the four-member prenatal team shared one tiny office and had just one exam room to call its own. work pods for the OB staff in the new prenatal wing. does paperwork in the other prenatal pod. new exam rooms for expecting mothers. 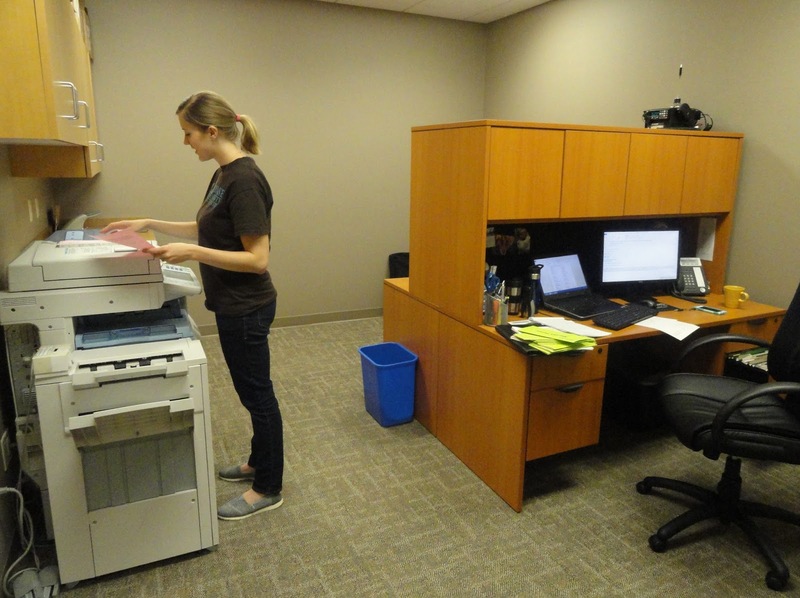 Executive director Nancy Dykstra has moved into a new office. Her previous office now houses Dr. Del Lassen, Promise’s medical director, and will be shared by Dr. Kenneth Tjeerdsma, Promise’s new dentist and dental director, when he begins seeing patients in July. packet in her new office to prepare for a meeting. The expanded area also includes offices for chief financial officer Amy Kleinhesselink and clinic manager Brittany Hamm and a shared office for executive assistant Amy McAlpine and public relations/development coordinator Derrick Vander Waal. Previously, all four employees worked out of small offices shared by at least three people. in Hamm's new office in the building expansion. matters in Kleinhesselink's new office. Derrick Vander Waal in the expansion. 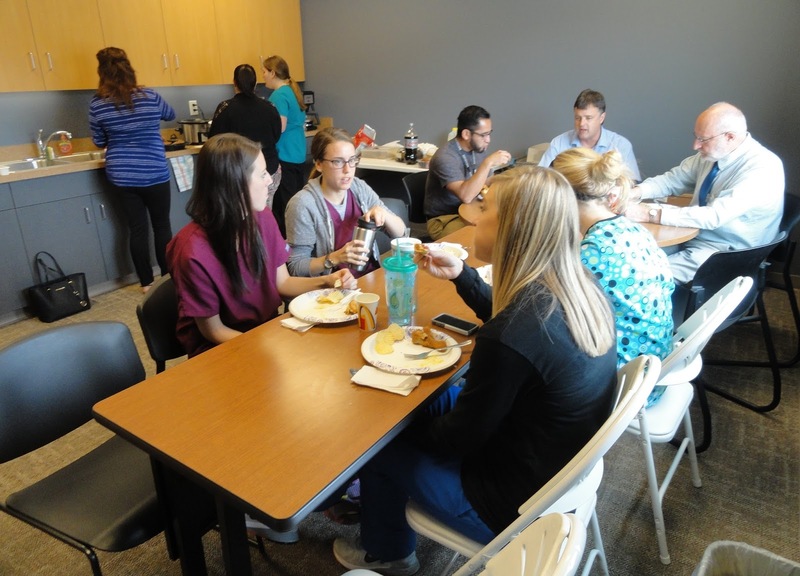 Promise employees now have a new and larger breakroom that allows many more people to use at one time than in the past. They particularly love the large window that brings in natural light and gives a view to the outside – even the backdrop of the alley and Dumpster! The previous breakroom has been converted into an office for behavioral health consultant Mike Inman and behavioral health care coordinator/interpreter Pedro Ruiz. Inman previously had his office in a procedure room, and Ruiz had a desk area in a back hallway. like the more roomy environment and natural light. The expansion also includes a behavioral health therapy room that will be outfitted with comfortable furniture and two restrooms. That’s the new tag line that Promise Community Health Center is committed to live by. 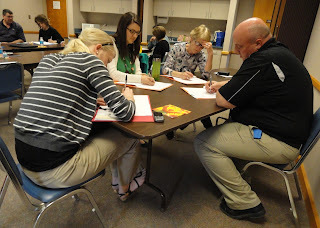 a strategic planning session this spring. Executive director Nancy Dykstra said the key word in that sentence is “together.” Promise works with multiple nonprofit agencies, public and private health entities and medical providers, and the faith community to address community health needs. Dykstra said that extends beyond care that doctors, nurses, dentists, midwives and behavioral health specialists provide. It might mean walking someone over to the food pantry or helping them get meal service set up, referring them for heating and fuel assistance, making a call on their behalf to get utilities set up – whatever it takes. This spring, staff and board members pondered Promise’s past, present and future as they worked through the visioning process. First, a facilitator led groups of staff members through a process to draft initial mission, vision and value statements and meshed them together to create concise thoughts. Promise’s leadership team then refined the statements. 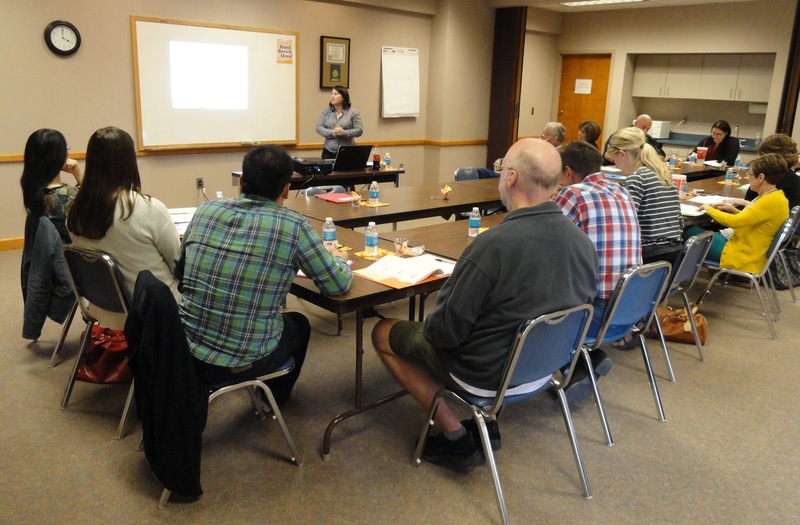 The board further worked through the wording as the opening task of a strategic planning workshop and gave formal approval to them at its next monthly meeting. In addition to a tag line, the process resulted in mission, vision and value statements. discuss ideas during the planning session. Dykstra said Promise is delivering on “the promise of a healthier community” when its mission is followed to the fullest. She noted that the mission also promotes flexibility. The “accessible, holistic health care” provided by Promise must continually evolve because the community and people constantly change. The value statements fall under three words: Acceptance, teamwork and integrity. She said those values rose to the surface through conversations by staff members about what they value most in the work they do at Promise. Dykstra said the mission, vision and value statements helped set the tone for the board’s strategic planning session and will serve as Promise’s roadmap into the future. The mission of Promise Community Health Center is to provide accessible, holistic health care that adapts to the needs of the community to improve the well-being of all persons. Our vision is that together we will deliver the promise of a healthier community. Acceptance: Treat everyone with dignity, welcoming all persons and caring for each one with compassion. Teamwork: Work together and share knowledge for the benefit of our patients and community. Integrity: Build respect and trust from patients, team members and the community through excellence of care. Together we deliver the promise of a healthier community. SIOUX CENTER – Dr. Kenneth F. Tjeerdsma desired the opportunity to return to northwest Iowa where he grew up to serve patients. He will get that chance. Dr. Tjeerdsma will serve as the new dentist and dental director at Promise Community Health Center in Sioux Center. His tentative start date is July 1. He is excited for the opportunity. 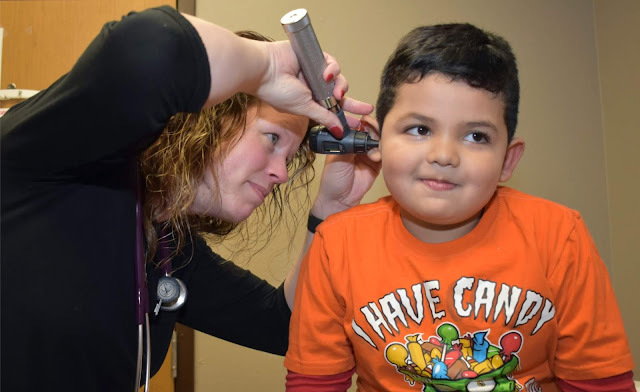 “The people at Promise Community Health Center are very friendly and welcoming and care about meeting the medical and dental needs of those in Sioux County and beyond, particularly those who are underserved,” he said. Dr. Tjeerdsma graduated Siouxland Community Christian School in Sioux City as the valedictorian in 2006. He earned his bachelor of science degree in chemistry from Creighton University in Omaha, NE, in 2010. He completed his dental training at Creighton University Dental School in May. Q: How did you originally become interested in going into the dentistry field? A: I remember looking at different professions and the kind of traits that would be needed to do well each one. I thought that my temperament and skill set fit dentistry, and after shadowing a few dentists, I was excited about the idea of becoming one. Q: What particular aspect of dentistry interest you the most? A: I enjoy interacting with patients and educating them about proper dental care while serving their dental needs. Q: What are you most looking forward to as you start your dentistry career? A: I look forward to practicing everything that I’ve learned in dental school in a real world setting. Q: What are your overall thoughts about starting your dental career at Promise CHC? A: I think that Promise CHC is a good place to start. Promise has solid leadership and will allow me to gain more experience in management skills as well as honing my dental abilities. Q: What do you hope you can bring to Promise CHC? A: I hope to bring high-quality dental care along with a good work ethic and a positive attitude. 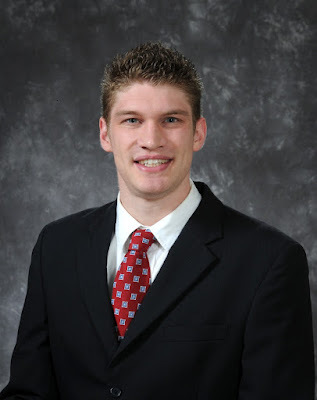 Dr. Kenneth F. Tjeerdsma is the son of the late Dr. Kenneth A. Tjeerdsma and Melissa Tjeerdsma of Sioux City. He has an older brother, John, of Tulsa, OK; a younger sister, Elizabeth, of Sioux City; and a younger brother, William, who will be enrolling at Dordt College in Sioux Center in the fall. He enjoys following sports, politics and current events and is an active member in his church, Cornerstone World Outreach in Sioux City. He plans to relocate to Sioux County as he begins his dental practice. SIOUX CENTER – Iowa communities are experiencing rapid ethnic and language changes. Sioux Center and the communities of northwest Iowa are no different. 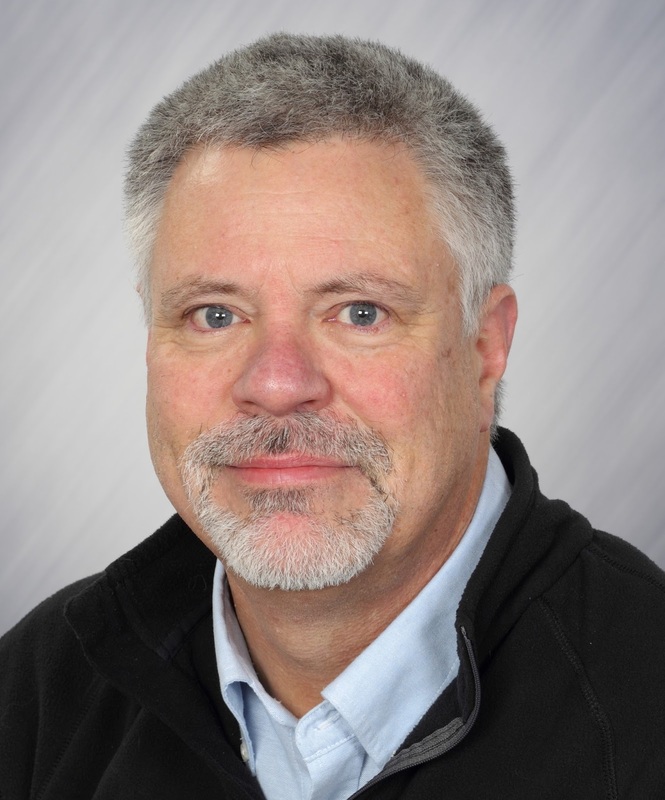 Dr. Mark Grey, director of the Iowa Center for Immigrant Leadership and Integration at the University of Northern Iowa, will explore that topic in a seminar that is open and free to the public. Promise Community Health Center in Sioux Center is sponsoring the event. His presentation, “New and Diverse Populations: Challenges and Opportunities for Iowa Communities,” will be 1-4 p.m. Tuesday, June 16, in Room 1606 of the Science and Technology Center at Dordt College in Sioux Center. People are encouraged to enter the building through the new south doors of the expanded building. Grey said the presentation will explore the ethnic and linguistic changes that have happened in several Iowa communities, including the Sioux Center area, and provide an overview on how communities are responding to meet the challenges and embrace the opportunities associated with the newcomer populations. How are the populations in Iowa changing? What can we learn about immigrant and refugee populations? What is the role of newcomers in the vitality and growth of the community? How do we communicate and build understanding? He noted that a major part of Promise’s mission is to adapt to the needs of the community, including providing accessible care for immigration populations. Therefore, the health center was motivated to put on the seminar and share it with the community. “This is a way to bridge the divide for greater understanding and better communication and compassion between the cultures,” Inman said. He said Grey has done much research and is highly knowledgeable in the topic of diversifying populations. Some new languages in Iowa are rare languages that are spoken by just a few thousand people around the world. Therefore, it’s difficult to find interpreters for many of these languages.